It can remove/unblock content, services and different websites that is normally blocked by your ISP. It can anonymize your connection because nobody likes to be spied on and tracked. it will secure and encrypt your connection especially if you use public access internet such as Wifi, Hotel or Cell Phone internet. Using PD-Proxy makes it impossible for others to spy on you, they can't even see what sites you are visiting when you are using PD-Proxy. No one can tell your real IP address or identify your locality. All the programs installed on your computer will be working automatically via VPN, which is the main difference between VPN and proxy server, requiring software support for proxy connection. 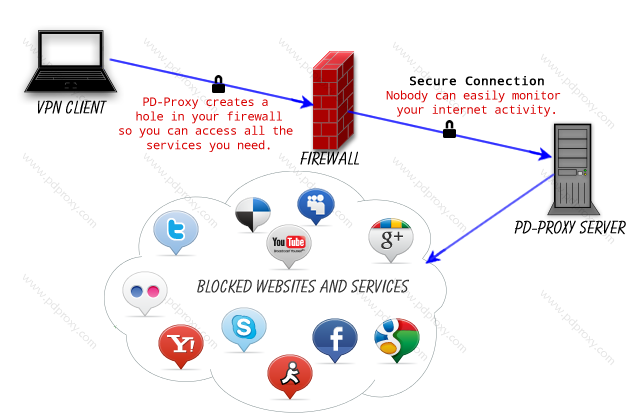 Our VPN services bypass internet filters, and internet browsing goes uncensored. At the same time you are secure, its more like getting complete freedom on Internet. So do you really need a VPN? Click here to learn more why you should use a VPN.